The Browns have designated Alex Mack as their transition player for 2014, meaning they can match any offer for Mack, Mary Kay Cabot of the Plain Dealer reports. If Mack plays under the tag, he would receive $10.039 million for 2014. 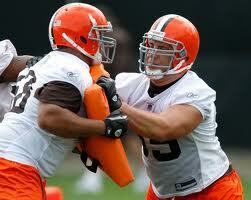 A team signing the Pro Bowl center would not owe the Browns any compensation. Teams can begin contacting Mack on March 8, and extend offers March 11, the start of free agency. Meanwhile, the Browns chose not to franchise safety T.J. Ward, meaning he’ll likely hit the free-agent market.